Taking the children crabbing when you visit Maldon is a really fun day out. It’s a truly British activity that keeps the children interested and occupied, and is also surprisingly addictive for adults. The Green Shore Crabs found on the Essex coastline grow to about 3 inches and are opportunist scavengers. They live in the mud and amongst seaweed and will eat just about anything they come across. After mating, Shore Crabs produce nearly 200,000 eggs which the females carry on their legs until they hatch. The crabs look squat and somewhat ugly and have claws that could give you a fair old pinch so do take care when handling them. If you have to handle them then it is best to pick them up from behind with your finger and thumb across the widest part of their shell. If you wish to keep the crabs in your bucket for more than an hour, please ensure you add cool water regularly and try to keep it out of direct sunlight. Crabs like a variety of bait including bacon, chicken, fish, tinned sardines and offal. You don’t need the good bits – crabs are voracious carnivores and not that fussy when it comes to raw meat. 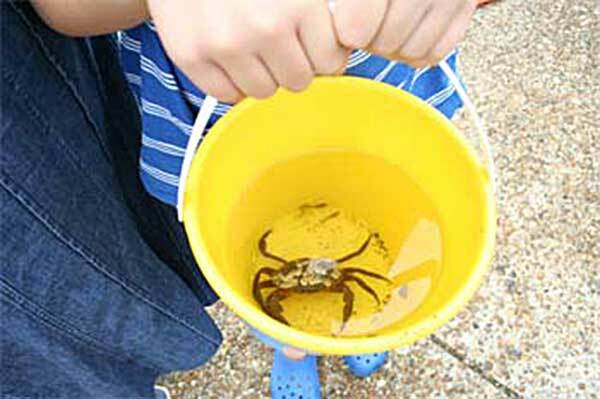 In Maldon, the area around Promenade Park is the best place for crabbing. The most popular spots are the boating lake, along the estuary edge and at Hythe Quay. Other great areas to crab in the district include Heybridge Basin, Burnham-on-Crouch and Tollesbury. Please check tide times in advance. The boating lake can be used at all states of the tide but for the other locations you will ideally need to be there an hour or so either side of high tide. All children should be accompanied by adults and extra care should be taken close to the waters edge. You are strongly recommended to wash your hands thoroughly after!!! All you need is a long piece of string, a weight, some bait and a bucket. The string should be at least twenty feet long (they are sold cheaply at the kiosks in Promenade Park if you come unprepared). The weight (which can be a stone or anything heavy enough to sink the line to the bottom) should be tied to the end of the string as should the bait. Those little bags that come with washing powder tablets are brilliant for filling with bait and just dropping in the water. Please do not use hooks. Firstly fill your bucket with water from the Estuary. If there is room, add in a few stones or weed and some bait so that the crabs can hide and have some food! Let your line drop right to the bottom where the crabs live. Wrap a little line loosely around your finger and wait patiently - about 5 minutes should do it. Raise your line, it should feel a little heavier, and clustered to your bait, there should be a few happy crabs munching away. Wait a little while until the crabs have a firm hold and then bring the line up steadily and smoothly. Not so fast that the crab senses you pulling, and not so slow that he’s eaten up the bait and dropped off. You will land more crabs if you also have a children’s fishing net but otherwise half the fun is seeing whether you can bring up your line before the crab drops off. To remove the crab, you can either let it drop off into your bucket or hold the crab by the shell on each side just behind the pincers with your finger and thumb. Their pincers can’t reach around enough and you don’t hurt the more delicate parts of the crab. Once you’ve finished crabbing please release the crabs back into the water where you caught them.